The Golden State Warriors enter sudden death basketball in Game 6 of their Western Conference finals series against the defensively brilliant Houston Rockets, who will be without Chris Paul for their trip to Oakland. Join The Roar for live scores and coverage of the match from 11am (AEST). Houston has held the Warriors to under 100 points in back-to-back games now, winning one on the road and then taking Game 5 by nothing back at home. The Warriors haven’t been held to under 100 in back-to-back games for more than two seasons, so for the same team to do it in two straight games says a lot about the commitment and dedication of the Rockets, who have always been offence first. The offence-first approach works, but can only do the job so many times against a like the Warriors, who are one of the best outfits basketball has ever seen. While their defence has been fantastic, it’s been made possible by guard Chris Paul leading the way, a heavy inside presence and the Warriors lack of Andre Iguodala who has been out with injury for the last two matches of the series. 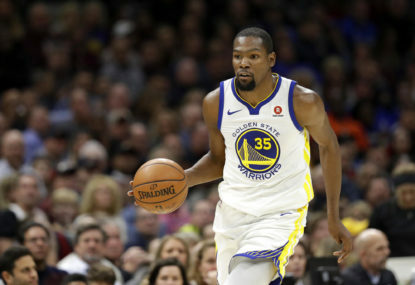 Iguodala gives the Warriors an extra option on the floor, freeing up space for shooters like Steph Curry, Kevin Durant and Klay Thompson, all of whom tended to struggle in Game 4 and 5 as the Warriors first squandered home court advantage and then put themselves in a sudden death situation. To go with the likely return of Iguodala, Paul will miss Game 6 and potentially Game 7 with a hamstring strain. It’s going to lump the pressure on James Harden, who has had a good series, but was extremely quiet last time out at home as he finished with 19 points on 5 of 21 shooting. Those numbers are horrendous, and unless he gets other contributions from players like Trevor Ariza and Clint Capela, Harden is going to need to at least match the offensive output provided by Curry, Thompson and Durant, which has the potential ability of forcing him to overplay his hand. That’s the last thing Houston want in this one, yet, they may have no other option but to run all their offence through Harden in an attempt to win the series without having to enter a pressure cooker in Game 7. Back at home, with Chris Paul out, the Warriors should be too strong for the Rockets and force a Game 7 in this see-sawing, epic of a conference finals series. Be sure to join The Roar for live coverage of the match from 11am (AEST) and don’t forget to add a comment in the section below. One of the mainstays of The Roar, Scott Pryde has written over 2500 articles covering everything from rugby league to basketball, from tennis to cricket.